The NoiseMaker plugin adds a further set of powerful noise generators to the existing NoiseMaker functions. The key difference to the noise created by NoiseMaker is that it is being generated in 3D instead of 2D. Most of these generators have common and specific settings, which produce almost instantaneous visual results. The workflow for using Surface Noise is the same as for standard surface noise except that you can now replace the default noise with one that is generated by the NoisePlug settings. Magnify by Mask slider: Changes the scale of the current noise within the Mask area. Strength by Mask slider: Changes the intensity of the current noise within the Mask area. By default, the result of these modifications won’t be visible until you change the Strength by Mask setting. Revert this value before validating if you don’t wish to change the Strength value. This new capability is helpful when you wish to hide visible changes on your surface when using the mesh UV’s or simply to add some variation across your model surface. Different variations of a noise, defined by different Mask intensity values. To open the noise Plugin, open the NoiseMaker interface by clicking Tool >> Surface >> Noise. Now click the NoisePlug-In button, which will open a new floating window. The list of Noise Generators, located on the left of the interface. The Noise Generator settings in the center of the interface. The common settings for each Noise Generator, at the bottom of the window. The basic workflow is to select your desired Noise Generator from the list, then modify the settings. The noise will be updated in real-time in the NoiseMaker preview window. If needed, changing the common controls settings will globally affect the Noise applied to your model. Note: It’s recommended to turn up the Strength settings all the way to 0.5 or -0.5 before clicking on the NoisePlug-In button. This will help you see the real-time interaction with the various noises. After closing the Plugin window you can then adjust the Strength to finalize the noise effect. When done, close the NoiseMaker Plugin. You can now also use the various settings in the NoiseMaker preview window to further adjust and refine the applied noise. If you need to modify the Noise such as by switching to a different Generator or altering the common settings you will need to get back to the NoisePlug-in by disabling it and then enabling it again. This last operation won’t change the current settings; it will simply reopen the plug-in interface so that you can modify those settings. The Noise generators can blend your model’s PolyPaint with colors defined in the NoiseMaker preview window. If you wish to mix two colors, you must first set the base color on your model by filling it via the Color >> Fill Object command. Each Noise that is generated has common Offset, Angle and Scale settings along the X, Y, and Z axis which affect how the noise will be applied to the model. Alter these settings to change the scale, orientation and position of the noise relative to the model’s surface. Please remember that the selected projection method (defined in the ZBrush’s NoiseMaker preview window as 3D or UVs) can cause the same Noise type to produce very different results. The Interactive Update button (enabled by default) makes your changes visible in real-time in the preview window. If a noise Generator requires too much computing time you can disable this option to speed up your workflow. The standard ZBrush 3D navigation and right-click navigation options have been added to the default NoiseMaker interface. Also, simple buttons have been added in the corners to help with 3D navigation if you are not used to ZBrush’s standard 3D navigation. When loading an Alpha as a NoiseMaker pattern in the editor, a thumbnail preview is now displayed in the bottom left of the interface window. This section provides a list of all 3D generators available in the plug-in, with a short description and the overview of their main settings. Be aware that all generators have common settings like Offset, Angle and Scale. The Brick generator creates bricks by defining the size of a single brick (Width, Height and Depth settings), combined with the distance between each brick (Mortar Thickness setting). The Camouflage generator creates a random pattern similar to military camouflage. It does this by using a Frequency setting to change the random aspect, modulated by a Threshold slider which changes the transition between the areas. (At Threshold 0, it displays the Surface setting color and at 1, the ZBrush front color. The color settings are based on a grey scale adjustment.) The colors can be swapped or modulated by changing the base and the Layer 1 and 2 sliders. The Checkboard generator creates a regular checker pattern. Each square can be subdivided into smaller squares by modifying the Depth slider. Enabling the Colors Randomize setting lets you apply a random color on each square by using the ZBrush front color combined with the active color of the Surface settings. This can be further refined by changing the Variability slider. The Cheetah generator simulates the cheetah fur pattern with irregular spots. The shapes of these spots can be altered through the Spot slider. The Corrugated generator creates constant rings around the model with different styles available, from smoothed borders to one-sided sharp borders. The Dents generator simulates a corrosion-like effect on the surface, perfect for old metal surfaces. The Erosion generator produces a result which is close to the Dents generator except that it focuses on edges rather than surfaces. The FBM generator applies a global noise over the model. The Detail value affects the density of the effect. The Gradient generator creates a linear gradient over the mesh in the direction defined by the X, Y and/or Z button. The Granite generator simulates the real-world granite material. The effect is modulated by the number of Octaves to create the amount of detail while the Frequency setting defines detail density. The Grid generator creates a grid on the top of the model where the Randomize button affects the intensity of the colors applied to the tiles. HexTile creates hexagonal tiles. The Randomize, Minimum and Maximum settings can affect the color of both the mortar and the tiles. The Houndstooth provides a set of different patterns like Chevron, Onyx or Sherlock. To change the orientation of these patterns, use the Angle sliders located in the Common Controls. Similar to the Houndstooth generator, Nested Shapes applies large scale patterns like Square, Tube, Cube or Sphere to your model, modulated by the Thickness slider. The Perlin Noise generator produces one of the most used and famous noise effects for your model. It can be used to create a large array of results. Increasing the Octave settings will produce high detail noise for your geometry’s deformations. The Plaid generator simulates the pattern of fabrics, composed mainly of a set of vertical and horizontal lines. Their Frequency can be modified, as can their colors. The Psychedelic generator creates a random pattern similar to the metallic elements found in some large floor plates. 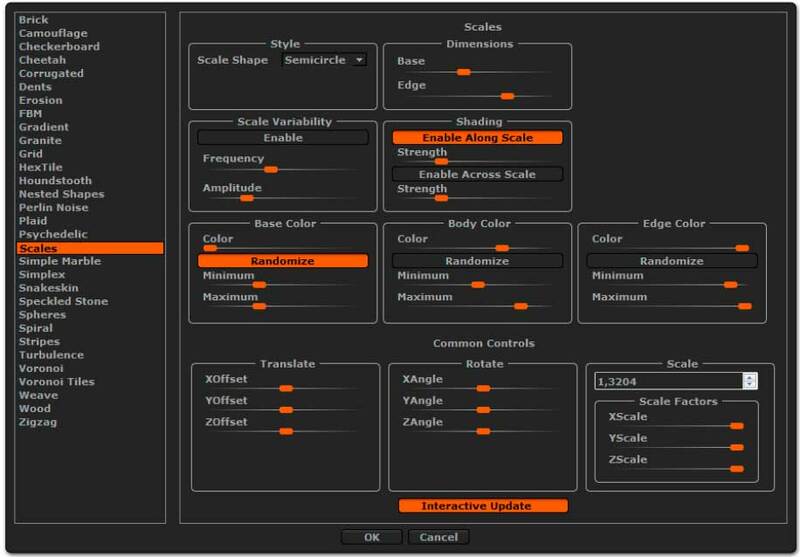 The Scales generator creates patterns based on scales and offers you a great control over its color aspect. The Simplex generator creates a very basic noise with very few irregularities. It is modulated by the Detail setting. Similar to the Scales generator, Snake Skin simulates the scales found on serpents. It offers great control over the scales’ colors. To make the scales look natural, apply some Scale Variability and especially some Amplitude. The Speckled Stone generator simulates small flakes within polished rock. It will produce a low level noise which is perfect when you want an effect that is only slightly visible. The Spheres generator creates random circle dots on your model with the option to Hollow them. The Spiral generator applies stripes over your model in a spiral pattern. The Spiral Rate setting controls the amount of bend in these stripes. The Stripes generator applies straight lines over your model. The effect can be modulated by different styles like a Perlin Noise, Triangle Shapes and more. The Turbulence generator creates an irregular noise with an important depth for both deformation and colors. This noise is perfect as a sculpting basis for wall details and more. 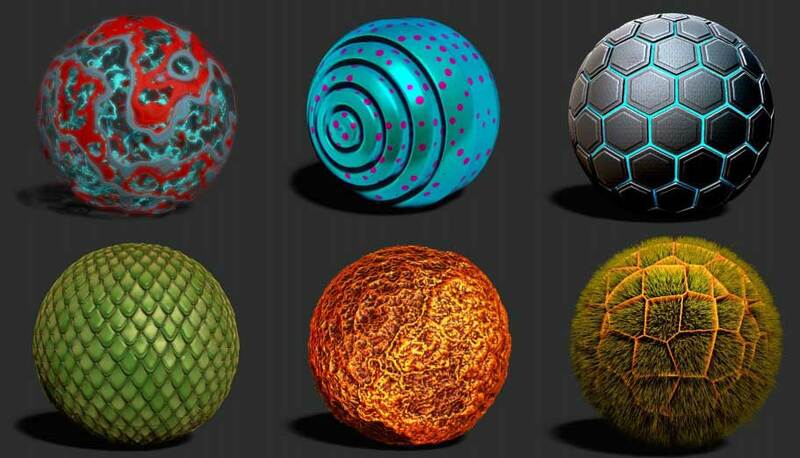 The Voronoi generator recreates a pattern similar to microscopic organic cells. The style can be drastically changed through the Type and Method settings. The Voronoi Tiles generator simulates irregular patterns based on the Voronoi algorithm to produce effects like cracked and pitted pavement. The Weave generator lets you use an over/under woven pattern. It is really useful for fabrics, plastic items or specific materials like carbon fibers. The specific effect is achieved by changing the Pattern style. It includes several color settings which give control for fine tuning for your patterns, whether they will be used for texture or mesh modification. The Wood generator recreates the grain of sliced wood. It can be modulated mainly by the Amplitude slider which creates irregular rings. The ZigZag generator creates an oblique set of rectangles for a zig-zag pattern. The Randomize color mode adds extra rectangles between the main zig-zag patterns.